I’d like Sage a whole lot more if it weren’t so hideously expensive. Everything on the main dish menu — meats, fishes and pastas….yes, pastas — tops the forty dollar mark, which means you’ll top a buck fifty a head here without breaking a sweat. That said, the cooking can occasionally be dazzling, with the starters and bar appetizers/small plates being among the best in the city. 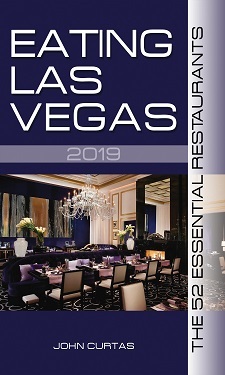 Combine them with a top flight cocktail program, jaw-dropping booze selection and the tastiest vegetarian dishes this side of the Wynn/Encore, and you have a worthy Top 20 selection, even if the main courses are sometimes not worth the tariff. Shawn McClain made his mark in Chicago with Spring and then with Green Zebra, where he proved himself an innovative master of mixing culinary metaphors. These days, he comes to Vegas about as often as I go to a monster truck rally, but under the watchful eye of Rich Carmarota, Sage continues to serve creative hyper-delicious food with a Midwestern sensibility that makes it all approachable for non-foodies as well as finicky gourmands. Resist the impulse to hang out at the bar over such gems as Vancouver Island Kusshi oysters dotted with a piquillo pepper/Tabasco sorbet, sharply seasoned Wagyu beef tartare, sinfully rich oxtail-and-beef-marrow crostini, or sweet and sour sweetbreads. Better plan: Drink there then make your way to the main dining room, and keep munching on every small plate in sight in one of Vegas’ most comfortable and dramatic spaces. The wine and craft-beer lists are full of well-priced, lip-smacking surprises, while the weekday happy-hour specials make this place a bargain-hunter’s dream. Save room for dessert, too, although I’ve still not forgive them for taking the pear tarte tatin with blue-cheese ice cream and canelés de Bordeaux off the menu. But these are minor quibbles indeed compared to a place where foie gras custard will make you think you’ve died and gone to heaven. Favorite Dishes: Sweet And Sour Sweetbreads; Foie Gras Custard Brûlée; Kusshi oysters with Tabasco Sorbet; Iberico Pork Loin; Wagyu Beef Tartare. Any and everything they’re serving at the bar; Absinthe Cart.